ROME, June 27, 2018 /PRNewswire/ -- After an encounter in Beijing last year, Lanzhou beef noodle and pasta met again, and this time it's in Rome. Lanzhou held a campaign on June 25 to promote its culture and tourism in the ancient city of Italy where the two local delicacies resumed romance along the Silk Road and helped enhance ties between the two cities. An exciting showdown was staged at the Sheraton Roma Hotel where chefs from the two countries made noodles on spot, bringing a "food feast" to the audience. Ma Wenbin, the fourth-generation successor of Lanzhou beef noodle, demonstrated how the delicacy should be made. At the hands of Ma, a piece of dough about 20 centimeters in length and about 4 centimeters in diameter was pulled into noodles of different widths. The amazing craftsmanship impressed Italian guests on site who saw the process for the first time. Pierandrea Giagnoli from Italy is a passionate chef specializing in authentic, regional cuisine and recipes. His highest pursuit is to find simple and authentic raw materials, and present the taste of food in the plainest way. At the event, Pierandrea Giagnoli was engaged in making pasta as if it is one piece of artwork. Different sauces offer the food a vital taste. Lanzhou beef noodle is one representative food of Lanzhou, capital city of west China's Gansu Province and one key city along the Silk Road. As one of China's top ten noodles, it enjoys a history of 102 years and is known for its delicious soup and refined noodles. Lanzhou is also honored as hometown of China's beef noodles. Pasta, with its unique taste and exotic flavors, is popular across the world as one of the most representative Western food. It is said that the first thing that every Lanzhou child who returns home will do is to eat a bowl of authentic beef hand-pulled noodle, while each Italian can tell a lot of stories about pasta. People from Lanzhou and Italy share similar attached feelings for the noodle and pasta, making them feel like old friends at the first meeting. 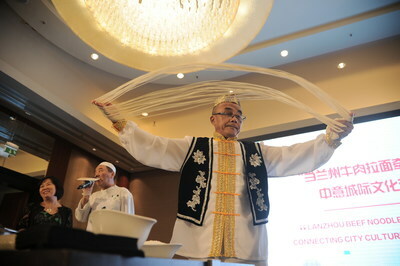 The event was held by Lanzhou government's publicity department and supported by the News & Information Center of Xinhua News Agency, Lanzhou Culture and Tourism Department, Lanzhou Beef Noodle Industry Association as well as the Italian Federation of Chefs. It is one of Lanzhou's activities to promote international exchanges. The event aims to leverage noodle and pasta to enhance mutual understanding in tourism, culture, food and other fields between China and Italy. It is expected to help tell more Lanzhou stories to the world and facilitate people-to-people and business exchanges.